[220 Pages Report] Modified atmosphere packaging is the replacement of air in a pack with a single or a mixture of gases wherein the proportion of each component is fixed when the mixture is introduced. High barrier substrates, such as ethylene vinyl alcohol, poly ethylene, oriented polyethylene terephthalate, polyamide, and others, become MAP packages after they are formed into trays, lid stock, or bags, and are filled with a selected blend of oxygen, carbon dioxide, nitrogen, and other environmental gases. The Global Modified Atmosphere Packaging Market has been segmented on the basis of application, geography, material, machinery/technology, and atmosphere/gases. On the basis of application, this market has been segmented into dairy products, bakery & confectionary, poultry, seafood & meat products, convenience food, fruits & vegetables, and others. On the basis of technology/machinery, the MAP market has been segmented into tray-sealer machine, horizontal & vertical flow packaging machine, deep-drawing machine, vacuum chamber machine, bag-sealing machine, and others. Similarly, on the basis of atmosphere/gases, this market has been segmented into nitrogen, oxygen, carbon-dioxide, and others. Furthermore, on the basis of material, the MAP market has been segmented into ethylene vinyl alcohol, poly ethylene, oriented polyethylene-terephthalate, polyamide, and others. The modified atmosphere packaging market is projected to reach $13.78 Billion by 2020 growing at a CAGR of 4.3% during the forecast period from 2015 to 2020. In 2015, the market is estimated to be dominated by North America, followed by Europe. The Asia-Pacific market is projected to grow at the highest CAGR owing to the rapid growth in the MAP market in this region. The growing demand for convenience and ready-to-eat food items in the emerging economies is also contributing in driving this market in various regions. The top-down, bottom-up, and demand side approaches were used to arrive at the market sizes and obtain the market forecast. An extensive secondary research was conducted to understand the market insights and trends, which was further validated through primary interviews. The report provides both qualitative and quantitative analysis of the global modified atmosphere packaging market, the competitive landscape, and the preferred development strategies of the key players. The key players were observed to prefer new product launches, developments, acquisitions, agreements, and expansions as strategies to garner a larger share in this market. This report also analyzes the market dynamics, winning imperatives, and issues faced by the leading players. The Global Modified Atmosphere Packaging Market is expected to witness a significant growth in the coming years due to multiple factors. The demand for products, such as convenience foods, seafood, poultry, & meat products; dairy products, etc., is constantly rising. This rise in demand has led the manufacturers and retailers to use different methods to extend the shelf-life of these products to cater to this rising demand without hampering their production rate and product presentation. Furthermore, the presence of top players in the modified atmosphere packaging market on a global level also drives the growth of MAP in the world. The modified atmosphere packaging market has been segmented on the basis of application, geography, material, machinery/technology, and atmosphere/gases. On the basis of application, the market has been segmented into dairy products, bakery & confectionary, poultry, seafood & meat products; convenience food, fruits & vegetables, and others. On the basis of technology/machinery used, this market has been segmented into tray-sealer machine, horizontal & vertical flow packaging machine, deep-drawing machine, vacuum chamber machine, bag-sealing machine, and others. Similarly, on the basis of atmosphere, it has been further segmented into nitrogen, oxygen, carbon dioxide, and others. Furthermore, on the basis of material, it has been segmented into ethylene vinyl alcohol, poly ethylene, oriented polyethylene-terephthalate, polyamide, and others. 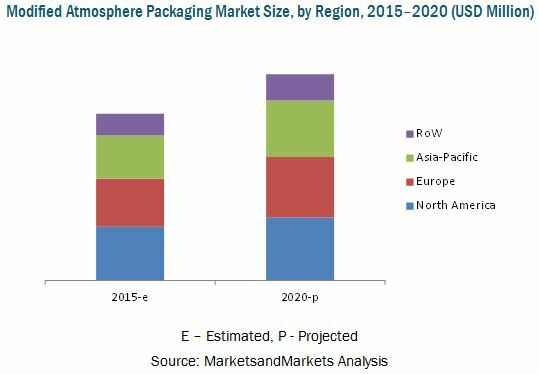 The modified atmosphere packaging market is projected to reach $13.78 Billion by 2020, growing at a CAGR of 4.3% during the forecast period from 2015 to 2020. In 2015, this market is estimated to be dominated by North America, followed by Europe. The Asia-Pacific market is projected to grow at the highest CAGR, owing to the rapid growth in the modified atmosphere packaging market of this region. The growing demand for convenience and ready-to-eat food items in the emerging economies is also contributing in driving the market. 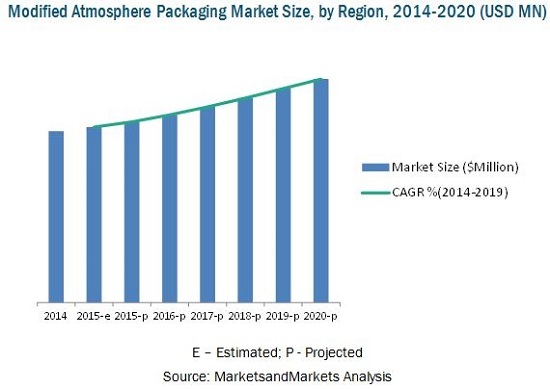 The modified atmosphere packaging market is fragmented and competitive, with a large number of players operating at regional and local levels. The key players in the market adopted new product launches and mergers & acquisitions as their preferred strategies. The key players are in this market are Linde AG (Germany), Berry Plastics Corporation (U.S.), Hayssen Flexible Systems (U.S.), and Dansensor A/S (Demark). 13.2 Air Products and Chemicals, Inc.
13.12 Hayssen Flexible Systems, Inc.
13.17 Robert Reiser & Co., Inc.